There's a new castle in town, and it's no joke! The Legacy Castle in Pompton Plains, NJ is a gorgeous new wedding venue in Northern New Jersey. When my clients (who booked the venue) first met with me, they explained that they had contracted the venue site unseen. Shortly after they were able to visit the enormous venue with work boots and hard hats to observe the progress if this luxury NJ wedding venue. Fast forward 19 months, the wedding day was finally here. Let me tell you, this venue does NOT disappoint! Not only was this castle absolutely gorgeous and incredible (as described) but the staff was so kind to my team. That really goes a long way when you've been working for 8 hours already and have 2-4 more to go! I really could have continued to photograph the bride and groom for the rest of the evening and never run out of locations or different looks. 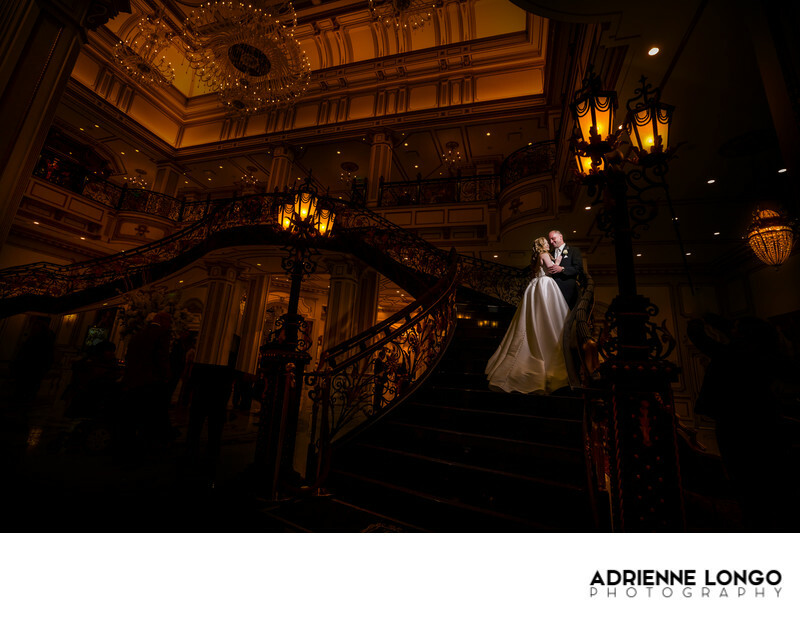 This photo of the couple took place on the stairs of the grand front entrance of The Legacy Castle. Guests were starting to walk in but you wouldn't know it! I executed the lighting in such a way that I could isolate the bride and groom and not see anything but them and the beautiful ambient glow of the surrounding lighting and incredible chandeliers in the lobby. I photographed the first winter snow wedding at The Legacy Castle! You can take a peek at that photo here. The owners loved it! I'm going to make some beautiful wall art for them to hang for future couples to see! How exciting! This is truly a luxury wedding venue! Your pictures at the Legacy Castle are going to be memorable and impressive! I really enjoyed working at this high end New Jersey wedding venue. The staff was incredibly kind and helpful. As I lurked around the castle, we were escorted by their wedding attendant who could make anything happen with 2 minutes tops.I would only expect such incredible service as we all know Mike the Situation's wedding was at The Legacy Castle. The castle has a reputation to uphold, and it does not disappoint. I saw so many more photographic opportunities that I can't wait to try out with future couples getting married at The Legacy Castle. I'm local to the area and less that 20 minutes away from this royal location. I can't say it enough, I had the best time being a Legacy Castle wedding photographer! If you would like to talk about how I can create memorable and epic photographs for your wedding day, please don't wait to get in touch! Location: The Legacy Castle 41 NJ-23, Pompton Plains, NJ 07444.